When we think of dispensers, we think of dots and beads. But many applications require a different kind of deposit. More like a smear. By combining our brush tips with our air-powered dispensers, syringe guns or bottles, many applications have been made easier, resulting in significant benefits. We stock the widest selection of luer lock brush tips. 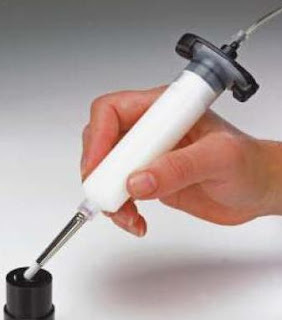 They attach to a syringe barrel when used on a dispenser by luer lock "twist-on". Liquid flows through the tip to the bristles to allow for a wider spread onto the part. Bristles are available in soft or hard type and in varying gauge sizes and widths. From 14 gauge 11mm wide to 22 gauge 5mm wide. Brush tips are compatible with greases, oils, primers, inks, thermal compounds, adhesives, glues, lubricants, solvents, activators and gels. For smearing greases to switches, contact adhesives to rubber, solvents to plastics, etc. The major benefit in using an automatic dispensing system with a brush tip is higher levels of control and reduced mess/ waste. Cotton swabs, general brushes, sticks rely on guesswork. A pneumatic dispenser applies the correct amount each time, for consistency. And for remote work or lower volume applications, our bottles and syringe guns will provide a high level of control over the fluid dispense and use the same luer lock tip attachment. 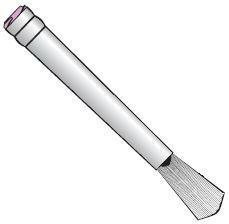 Using a brush tip dispenser is quick, simple to use and an improvement over a dip and transfer method. Less mess, less waste, reduced fumes, reduced hand fatigue, etc. We hold stocks of brush tips in all sizes. We also stock air-powered dispensers, manual syringe guns and luer lock bottles. All products are industrial grade safe. Very nice post, thanks for sharing the information. Keep up the good work.